Recording Blog - "Drums in his Heart"
Time to start a blog. In the event someone actually tunes in here and reads, I want to lay out as honestly as possible the thoughts and feelings of being 57 years old, fairly talented behind a drum set, engaged in recording music after 30 years of other pursuits, and how this gig is shaping up, and where it goes from here. I'm a member of Bandmix, a "find-other-musicians" site. Been there for a few years, I guess. A guitarist in my area got in touch with me. We got together, shared ideas, and here we are recording music for a sixth CD. Of course, we haven't released the first one yet. Tom just wants to keep recording as much as he can before I leave the area. The music is free-form fusion, for the most part. Although, it isn't free of form, and it is as much ambient as it is energetic, funky jazz fusion. It's all the above. It is not "songs." It's one session, start to finish, recorded live. As a drummer it has allowed me to stretch like nothing else I ever played. But, as a recording artist looking for people to listen to it, what next? Tens of thousands, more, a hundred thousand new artists releasing recordings every year. Most sit in obscurity. Actually, if that is where this project ends up, that is quite alright with me. Not that we want to waste money producing disks. Hardly. But, I do find the knowledge of having an actual recording of a date, a session, a point in personal history, a musical event, a fairly satisfying thing. So, at the outset, though the music will have a very small possible listening base, and may never be heard by more than a few people who know us (family, friends, those wanting to encourage even if the music grates their teeth) I would rather approach this as something that is molded in and by and through personal achievement, not how many units we can ultimately sell. Right now it is microphones and wires like spaghetti everywhere, and equipment all over the place, and trying to "feel it" when the recording begins after dealing with a bunch of gear hassles, overheated sound rooms, and other odd events. Can something be produced which anyone would care to listen to? I like listening to it, warts and all. Surely there must be others out of seven billion people who would like to listen to it, too. The question is, How do you get it before them? But, I get way ahead of myself here. Right now it feels a privilege to have the opportunity to create music and have it "saved." No companies. No pressures. Just Tom and me, and our instruments. I've already designed CD packages for the six disks. I'm a diehard DIYer. I get into it full-bore. It's been a good experience thus far. Okay, so, new equipment is on the way. Overhead mics, new interface, and some other things to deal with "problems" that have developed; things over my head having to do with electrical issues, grounding problems with the laptop set-up, and other things. I've told Tom I believe this is pretty much the "swan song" for me; the last thing I do as a drummer, making music, for various reasons. For the most part the "waiting" is agonizing. I want to be at it and get things done. Tom is very methodical. I am far more jump in and "let's go, let's go." Somewhere between those two compass points a CD is going to emerge. We want the recordings to be as good as we can make them, musically and technically. With today's technology it is within the reach of hundreds of thousands of bands, and millions of musicians around the world, to make and record music. It's unreal. It harkens back to Legend, thirty years ago. Kevin found a studio, my parents co-signed a loan for us, we showed up, set-up, did everything in a take or two, found an artist for album artwork, found a place to mix the tapes down, found a company to print and press and we had 500 albums as a result. We did it all ourselves, as much as we could do. Today From the Fjords is a cult classic and worth a lot of money if you can find one. Well, today musicians can do the whole thing start to finish. They can even market and sell themselves. No, they don't have the distribution of signing with a major label. But they also have freedom, which is not to be taken lightly. So, I'm doing some homework to figure out what we do with the first CD when it's ready. I have always been one of those people who truly dislikes being told what I can and cannot do when I do, or do not want to do something. Making an album ourselves is right up my alley. After all the horror stories I have read in the last couple years of what bands go through when they get signed by a label, I'll take the DIY road and take my chances on what results. Bugs, bugs, and more bugs. Since moving everything to my place it has been three weeks of bugs - electrical noises and sounds that give the impression I'm living in a jungle when I put the IEMs in. Tom states with confidence our fourth week will be spent making music. Sounds good to me. Months ago Tom began by using a stereo mic for an overhead, and a kick mic. He then set up a couple Rode NT5s for overheads, and a Sennheiser e614 on the kick, and I have been very impressed with the sound he has been able to capture. Here at my place the drum set is three times the size. We have set up two Earthworks TC30s for overheads and the result is quite stunning. I wanted flat. I got flat. The drums sound like the drums, the cymbals sound like the cymbals, the effects like the effects, little to no coloration. The low end has increased a dramatically. Just wonderful microphones. We are using two e614's on the kick drums with good success. I had my doubts about a small condenser mic for bass drums, but Tom has made a believer out of me. I also did some research and made some Jecklin (pronounced Yek' - lin) disks. The one we are using so far has worked out really well. I've made another and we'll see if there is any appreciable difference. The concept is to create a natural stereo phasing which your ears hear as sound travels around your head. If you do a search you will find a lot of info about them. Most people just make their own, but there are a couple outfits that make them for those more inclined to purchase. If you have read anything else at this site, you have read I am a diehard DIYer. They're easy to make, too. In good headphones or IEM's we can actually hear the slight delay which does add to stereo image and fullness of sound. It's quite amazing. Tom has another interface and some other devices he's using to aid in removing the "jungle," and increasing frequency ranges. It's all basically Greek to me, but very fascinating, nonetheless. The new Audient preamp has worked with the TC30s to produce truly pristine, natural sound. On the drumming side, Mike Van Dyk, inventor of the Drumnetics magnetic pedal, came up for a visit and outfitted my pedals with the new upper magnets he has placed on his new models, the Drumnetics 3XF. To say this new concept has improved the action of the pedal is such an understatement it's ridiculous. I am doing even more of what my brain is sending messages down to my feet to do, then before. The pedal, LITERALLY, almost plays itself. If you have not checked out these pedals, DO IT. It is THE most incredible pedal I have placed my feet upon. It is a total challenge to every spring-based pedal on the planet. Nothing can touch it, imho. Seriously. So, this week it's hopefully time to create more Miledge Muzic. I'm looking forward to it. Okay, all the gear was set-up. Not all the bugs were removed, but it was time to just make music, so ... we did. The results of the new Jecklin disk and actually recording a full session with the Earthworks TC30s was really quite incredible. As we listened back Tom exclaimed it was like sitting behind the set. It was. I was afraid the chinas were too hot and overshadowed the snare when I rode on them, but Tom said listening back later at his studio showed no imbalances, at all. My homemade pyramid towers we listened back on probably have hot tweeters. I do favor a high-end listening experience. The disk I made is 9.5." The recommended size is 12" or 13." Tom said he thought they were a little too big. He was right. The smaller disk gave just the right amount of phasing delay. The drums exploded with natural tones, clean cymbal work, and broad, yet tight scope of stereo image. I can't wait to hear the rough mix of the session. For you drummers (which mostly anyone who reads this will be), a side note on a new (used) ride cymbal. This last session was based on a vibe Tom wrote which hearkens to the Peter Gunn sound from the TV series decades back. I had a blast coming up with stuff to do. I used every toy in the kit. My main ride for years has been a 40 yr. old, 21" Zildjian medium-heavy ping. Got it used years ago when I lived in Maine. For this session, this sound Tom wanted to get into, I felt the Ping was too strong, so I listened to literally dozens of sound files on the manufacturers sites and the 22" Sabian Artisan medium ride just kept calling me back to it. It's an expensive instrument. BUT, I found a used one on ebay. Ebay. The patient purchaser paradise. My last acquisition for now was a wonderful buy. I abide satisfied. The cymbal came with some greenish grunge on the edge, and lots of odd, dark stick marks. Typical finger prints. About 45 minutes of lemon ammonia and some Bar Keepers Friend powder brought it back to a new shine. Once set up the difference between it and the Ping was night and day, naturally, the Artisan being hand-hammered and all, but the density of the stick click which I heard on-line was there. That is what I wanted. I'm not a fan of the Turkish sound, per se. Generally too much wash and that classic "tah" sound. But, the balance of stick click and wash, and depth of sound this cymbal produces is absolutely gorgeous and it worked beautifully in the session. It also created a much larger gap of sound with the 19" UFIP medium ride I also have in the set. The bell is smaller than my 21" Ping, but it is more crisp, and brighter, and really sings. I use birch sticks, too. Hickory would chime this thing for days. So, if you are into a new ride check this thing out. It is definitely a jazz/fusion-type instrument, but I believe other genres could hear it as well. For me to recommend a hand- hammered ride is no light thing, trust me on that one. This is a musical instrument in every sense of the percussive term. With that session on the hard drive we now concentrate on bass and getting the first CD ready for mix down and production before we record any more new material. Onward. Bass. Discussion with an old friend. Next time. Every recording musician knows the frustrations of listening to their recordings, their performances, over and over again, and wishing some things were done differently. The logic is, though, that if you redo things, other original elements may suffer as a result. Alternate takes, in a lot of modern music, battle for ascendency in the minds of individual performers who liked this, or that, but not ... that. You can opt to piece things just so much before everything becomes something other than music. At least music by organic definition. So, there comes a point where common sense must take over and realizations of perfection must be let go of. Playing Miledge Muzic, extended blends of free-form jazz, rock, funk, ambient, and fusion, is a "warts and all" project. No musicians are perfect, because humans aren't perfect. Trying to make perfect music is for people enamored by technology. So be it. Tom and I are not. There are lots of wonderful and fantastic things technology offers. Nonetheless, in a final analysis for us, machines are cold hardware, and music is something alive that breathes human thoughts and feelings. We are committed to making music that lives in a real world, not the tech world of perfect time, perfect notes, perfect arrangements, and perfect (read fake) performances. That doesn't mean we have no standards, no expectations, no checks or balances, and no respect for music history and achievement, including modern recording equipment and techniques. These things exist and we draw inspiration from them. We use it all to make the best music we can, trying to stay focused on an overall goal - producing something interesting, exciting, and provocative to listen to, but not perfect. Not every recording session meets that goal. Not any session is "perfect." Ones that meet a standard of our goal will be turned into products for others to listen to. Our goal is to create something real, like life. An aspect of life. The aspect of movement beyond 3 or 4 or 5, 6, 7 or 8 minutes of life found in most music. Classical music is an obvious exception. Creating something like our music on the spot and moving it along for an hour and a half or two hours, or more is risky and challenging, and is physically exhausting for me. It's an athletic event. In some cases these "events" will be segmented, like the coming first CD. In others it may be a double CD capturing an entire session. Upon listening back to our sessions it came up in conversation one day that we are making soundtracks with no movie. Most movies are shot and then music is added. In our case we feel as though we have made a soundtrack and the movie has yet to be made. In many respects it was made in our minds as we performed. The music shifts through scenes seen only in our minds. I find it interesting that most modern music functions in this mode of 3-6 minutes. It was not always so. Not in the Psalms. Not in Classical composition. Maybe it's a fast food generation thing. It is stated human minds cannot follow something longer than that and desires change. Certainly modern camera work, changing scenes every three seconds only compounds that problem. It is a problem, because it isn't reality. No one looks at anything from different angles every three seconds. Such production gives me a headache when I have seen it. I especially dislike it when concert video is produced that way. It ruins the music for me. It gets in the way of the music. It takes the place of the music because no one in the audience is viewing the performance that way. It's more a film producer's gig than the band's. Close-ups are great. Close-ups changing every three seconds are mind numbing. Making what some might call avant garde music that really stretches time on the clock; that breathes, that prolongs an ending, that creates imagery and scenes is exciting to me. I truly wish more music was made like this. There's an old saying, "Want to make God laugh? Make plans." As far as our first recording, we have learned some important things. The old friend I mentioned above offered to try and lay down some bass tracks for us. After listening to the tracks for awhile he decided to "gracefully bow out." Getting over the disappointment I sat down down and listened to the music from a bassists perspective. Tried to, anyway. From a drummer's perspective, from Tom's perspective I hear all kinds of bass lines and things a bassist like my old friend could instill into the music. But critically, from a bassists point of view, playing to this music after the fact, with it's many changes of mood, keys, timing issues and all would be a very labor intensive endeavor. Especially would that be the case with someone who lives hundreds of miles away, as my old friend does. It would be constant phone or email discussion how a bassist should approach various sections, and how to deal with things within each section, and after awhile it is easy to get a grip on how someone would rue the day they ventured down the road of adding their own talents to this music. Listening to the music from this new perspective, and talking this over with Tom, forces us to realize if we want bass to fill things out, those lower frequencies will have to be supplied by us, and more so Tom who played the original guitar tracks. To be quite honest, trying to play my MalletKat to this music proved over my head, as much as I wanted to do it. Tom does some pretty far out stuff which I found difficult to follow and interpret. So ... Tom is now trying to find time to lay down complementary tracks of sounds from his wide array of sound sources and gadgets. Knowing him, just adding some bass guitar is not going to be the outcome. Been a few weeks since the last entry. Tom has attempted to lay down some bass. Interesting results. It is certainly nice to hear the third voice in the music, and that goes along with sessions done with other musicians. It adds another dimension. The thing is, that new dimension is both good and not so good. The bassist friend of mine who offered to lay down some tracking for us stated our music is so full of energy and change he truly had a difficult time figuring out what to play. Hearing Tom's bass work helps me to accurately understand what my friend was facing. So ... my expanding take on this is for Tom to be Tom, a guitarist. Leave the bass aside, leave typical rules aside, and just Play Yer Guitar! Tom is not a bassist. He does not think like one, and that is apparent, and he surrenders that, but accepted the challenge just the same. He thinks like an avant-garde guitarist, because that is what he truly is. THAT is how he must approach this avant-garde music. Bass needs to really lock with the drums. But Tom is thinking other things, musically, because he's a guitarist. I have seen reviews of music performed by one artist. They all say, even if very good, it sounds rather homogenized. I can hear that in this case. Tom wants freedom to express. Bass kind of gets locked in patterns, even if you're Jaco, Stanley C., Victor, or Kai. Bassists stay close to the drums in many respects. Sometimes, with modern techniques, you can hardly tell if the drummer or bassist is playing. Sure, most of the music itself is common and typical by virtue of the tempos and basic structures I play. So, in many places Tom's efforts at bass sounded good. But when it came to ambient sections, and other tricky places of drumming textures and timing, the bass actually became distracting to me as I listened. It just dawned on me that musicians, at least in our case, for Miledge Muzic, have to find a voice and keep it, make it their own, and really own it. I have always believed that for drumming. I see its virtues now for music itself and recording of it, as well. I've asked Tom to basically look at the music as our own creation which does not need to fit into any kind of format out there. It's our format, which is somewhat undefinable for people to categorize. Why spoil the fun? Play Yer Guitar! Where the sessions need another voice, play yer guitar. Be inventive and have fun and make it your own. Where the music stands on its own, just guitar and drums, leave it alone. That is our voice, our sound, and for many people who have listened, it's a pretty full and energized, and even a unique sound. Works for me. Recording music is an adventure, to be sure. If you are going to put something down for permanent keeping, and all the world to hear, make it your own voice, your own sound. Even if it appeals to no one else, you can abide satisfied you stayed honest in the process. We certainly hope people will like what we've come up with. I had hoped our first CD would be ready by Autumn. Looks like the new year will be more realistic. And what will this next year bring on this crazy planet - for Miledge Muzic, for America, for the world? Been a month of just about everything, but recording. After deciding we would just stay a guitar/drums duo the task of how we address some spots on Track 2 of the CD emerged in all its nagging reality. In listening back to it, and sitting behind Tom in his studio, I began to hum some harmony to his guitar lines. He turned around and said, "Why don't you just sing a backing track?" Well, after actually spending a few weeks listening to it every day and attempting to sing to various sections I decided to give it a whirl. We were reminded that Pat Metheny and others have done things like this. Nothing original about it. In this case the actual nature of the singing was not only difficult to do, for me, considering Tom's choice of key signatures as he played, but also because the track, which is called The Long Night, already had a tossing and turning, bad dream-kind of effect on me when hearing the first 25 minutes for the first time. The vocal lines were then already drifting that way in my mind. Track 1 carries the simple title The Long Day. It all fits (at least in my mind). When we listen back to things the first time various ideas 'hit' me. In the case of this first session for CD the whole scene of a long day and long night just enshrouded me and it seemed logical. I often wonder how instrumental music is named by musicians. Those into playing instrumental tunes have the task of naming cuts. When I have seen them over the years, since the 70's, I have asked myself why on earth is that entitled that? Of course, what else would it be entitled? One title is as good as another with instrumental music. I guess I get a little more into it, and in the case of playing 30-120 minute sessions an entire theme comes upon me as I listen back. So, with a dream sequence in my mind I proceeded to vocalize exactly that. I did my thing, came around the corner, and Tom says, "I know exactly what this needs. More tracks. Three, four, ten more tracks!" Well, I whittled my way through three more attempts and stopped with laryngitis saying Hello from the back of my throat. Playback, while I sang, had some issues, mostly with balance and verb and things getting totally overloaded in my IEMs. I just pulled sliders back and went from memory. Talk about winging it. I kept thinking, "This has got to sound horrible." When I finished Tom said, "This sounds great. You'll like it." Well, things being what they are with little time to work on things I haven't heard the thing yet. Did I mention Tom is into Edgar Allen Poe? I hope you have a Happy Thanksgiving. Well, six months have gone by. I've been away, working. Didn't have direct access to the web. Tom hit some major snags at his own job, and it took a toll on progress for the recording. I did not think anywhere near this much time would transpire in creating a CD. In reality, it's just life. The music has been recorded. I am now seeing that is the easy part. Fixing things and then actually mixing tracks is another matter. I went by Tom's when I got back from Texas. We sat down and discussed things. He opened up the tracks on some new gadgets he's gotten in the last few months. I thought things looked different. We listened to things, and discussed some more, and we came to some conclusions on how to fix some minor glitches in the recording. Hopefully the glitches can be addressed this week, and we can then get down to mixing things. It's a major heartache when you put a lot of time, effort, and scarce funds into music, in this case recording music, but it isn't your "bread and butter." Your life as a musician is intertwined with other aspects of daily living which can enhance or definitely interfere with how your music takes shape. The calendar becomes a nemesis, not a friend. You fight thoughts and feelings of just packing it in because progress hits a snails pace. At the very least you begin to wonder about the actual merit of the music, itself. Especially is this the case with Miledge Muzic because it's not in a category of genre easily defined, will have a small audience, at best, and its vigor ain't getting any younger as Tom and I slide toward 60. Tom sees light at the end of the tunnel. He's got a musical grip on the situation, and I hope we can see some progress a.s.a.p. Mix down! Indeed, after a year of "life" we have finally reached a place where we sat down and mixed a track. This is exciting. Two years have gone by since we first recorded. Where - did - the - time - go? We both found a pocket of time to work with, and I went over Tom's to work out some details, and have a go at mixing the first track on the CD. Now, bear in mind, with free form music as we play it there's only two tracks in the project. So this was work on thirty-two minutes of music. I was as anxious as a cat eying a bowl of fresh tuna. I haven't seen Tom in months. Went over earlier than usual. He was still eating breakfast. He sat me down to listen to some things from Track 2 on a laptop set up with new recording software and went back upstairs to finish eating. I looked around at Tom's room and thought it felt ... packed. When he came back down I said, "Is it me or have you added a bunch of stuff in here. It feels more crowded than usual." He quickly replied, "Be quiet. It's you." Ah, yes. Tacit admission more goodies had been acquired since my last visit. We mixed according to headphones we each had. He used his AKGs, and I used a new set of Shures, and my old, trusty Etymotic Research ear phones. He also had a couple other sets. Amazing to hear the differences in each and what they bring to the audio table. Some sounded very tight, focused, "dark" in Tom's description. Others had very spacious sound, wide open. They all had great clarity to work with. I heard things Tom played which I never heard before just listening to rough mixes in the car, or on my laptop bar. I've read mixed reviews by producers and techs about using headphones/earphones to mix with. In this case, Tom having older, less than sterling sounding speakers to work with, and leaning towards those who say you can get a fine mix in good phones, we opted to get and use good phones instead of pricey monitors. Looking at a screen crammed with Cubase visuals and other assorted software images tends to glass me over and trance me out. Tom has the added features of having the whole rig tied into a 'regular' analog board. May as well be the inside of the Space Shuttle to me. I watch him do his thing and I admit to incredible fascination at what modern recording equipment does, and can do. I also learned that having all this, while providing a thousand more options, also creates more time to get things they way you wan them. The tendency towards 'perfection' is ever present. I do not believe music can be perfect, owing to basic humanity. So the idea of perfection is not something I care about, and in trying to come up with a perfect recording of free form music, with no mistakes or foibles in a half hour or twice that to a session? Forget it. I drop my sticks, so be it. Grab another and keep playing. That's life, and Miledge Muzic, if nothing else, is life, as we experience it. Editing is far more simple and accurate than using a razor to splice tape (if you're old enough to remember those days and the geniuses who worked wonders doing it). It also actually takes more time setting up the edits when you can mark places to the nanosecond. Clicks and drags dot the musical landscape on screen, and on playback it all follows the dots and graphs. It's incredible. We had some issues to address, so Tom decided to just create a new project with just a drum track, and one with just guitar. Editing became easier to address that way, and keep things in sync. This allowed for more easily addressing drum volume separately, which tended to overpower the guitar work a lot. But that idea took the computer two hours to do, owing to the speed of Tome's PC. We caught up on things going on in our lives, and talked about the music and all. Not a wasted minute all day. With both separate tracks in their own 'package' to work with Tom began to set markers and graphs to automatically control the volume of the drums at crucial points along the track. Fascinating. But what we ended up doing was me holding a small device with a slider which controlled drum volume and I manually placed it all as the music played back. I got it all first shot, Tom saying I was a "natural," and after eight hours we had a finished stereo track to check out on other systems. After a long day I got in the van and headed home and popped in the CD to hear what we had. Remember, for these first sessions we recorded I used the drums at Tom's studio. A five pc. set of Argent drums. Most drummers will say to themselves, "Argent? Never heard of them." They are beginner's drums. Tom didn't know that when someone sold them to him. That first session was ... well, as I've stated elsewhere, upon tuning them up lugs broke on one tom, reducing me to a 4 pc. The snare, a chrome, six-lug wonder, was the worst drum I have ever laid sticks to and made the session a physical nightmare for me. No decent bounce, no decent tone, a totally indecent drum. The bass drum ... actually the sound was okay after I pulled out the pillows and worked with it with a Gary Chaffee drum muffler, but the pedal was a bottom of the line Yamaha, and it's action was a curse. There was no kind of protector on the batter head, so I applied some layers of packing tape to it. Unfortunately, the way I play the kick (lots of notes) the beater wore through the packing tape, the friction softened the glue, and the beater began to stick to the head! The throne he had left me with back pain and numb legs at the end of the day. I had as much fun as doing an obstacle course in the mud (actually my daughter does that and has a lot of fun, oddly enough). I'm glad I brought my own cymbals over. That made it a slightly bearable experience. From the very beginning I hated that session. But after time, listening to what we actually recorded I felt it had to be the first release for it's sheer production of thought and energy we plowed through. For whatever reason the kick just did not record well. I do not like the feel or sound of felt beaters. I make my own wood beaters from drawer knobs and other things, and add a patch of leather to them. So the felt beater left things with mellow attack. After fussing with all kinds of EQ and other gadgets to refine the sound, I suggested we just raise it's volume in the mix. That one thing made it sound like a cannon, even the illusion of another musician in the mix, owing to the bass frequency. Tom was pleasantly surprised, if not shocked. But that Grand Canyon sound in the headphones just seemed to get lost on my van stereo system. EQ settings helped, but it still went from a cannon to a pop gun on that system. Of course, listening to the music in top of the line headphones all day and then the transition to the van system was an audio shock to begin with, but upon a second listen my ears adjusted and I enjoyed the recording back to the driveway here. I also listened to it on other speaker systems hear at home and the kick was thumping, the overall balance of the recording is good, so I think we have a winner for the first track. I hope. Haven't heard from Tom yet. I'll let you know his impressions next time. Things are good to go on Track 1. We tackled Track 2 yesterday. The recording session that day was quite long, and we divided the performance into two tracks. The second track began and stayed with some guitar work that we have thought proved problematic for almost two years now. On the other hand, like our past experience has shown us, the more we listen, try to listen, with 'unbiased ears,' the more we hear things that can stand on their own without a lot of post-performance fussing. The guitar work on the beginning of track two is pretty heavy. I had thought for a long time it was too heavy, and too long a section for most of what we do, musically. The idea came to add something to the track. We decided on a vocal track(s). Not lyrics, just vocalization to ride over the top of the guitar track and attempt to soften it down. The results were less than pleasing. This guitar part dares us to mess with it. It literally stares us down and says, "Are you talkin' to me? Are you talking to ME?" A full day brought few ideas on how to talk to this track monster. We decided to just mix the track for balance first. That was easier than last week's work, although everything being on Tom's new laptop with new Cubase software made for some down time as he figured things out. I really admire Tom for the way he just jumps into things. He's a definite tech head. If he were a millionaire I'd hate to walk into his basement. Of course, if I were a millionaire it would be the same thing, I suppose. A drum shop in my office. Being as tired as we both are from other aspects of life it's difficult at times to maintain concentration. I even nodded off a few times with full blast playback in my headphones. Some say this is nothing to mixing down a full band and song by song material. No argument there. But quite honestly, for my ears, most music today is way too overproduced. When I hear what Tom was able to do with three mics on the kit I say more power to minimalism and just letting the instruments breathe and flow. No click tracks here. No producers taking charge of sound. The instruments are the producers, the musicians are the producers. That is the way music once used to be recorded. What you got was what the mics and tape heard. Anyway, with the track mixed down we both felt the guitar section, especially being 25 minutes long, was a tough dog to keep on a leash. More like putting a rock badger on a leash! What to do? Like much music, repeated listens can deeply effect one's perceptions and observations of what is going on. You just begin to get a more tuned idea of details and all. You hear more. Also, most modern music is named, and often the name of a piece immediately conjures up an image of the music in some way. My first listen to the section in question gave me the impression of a nightmare. I titled it, and track 1 thinking of them both in the selected imagery they conjured up and termed them as such The Long Day and The Long Night. Listening to the track from an unbiased, non-conceptual attitude two years later allowed the music to conjure up all kinds of different mental images. True, the images were mostly based on various events of aggression, like battle, storms, and the like, but if I used a little imagination on the humorous side to name the track the music took on a different vibe in my head. When I did that the music began to find its own place and the interplay between guitar and drums, and various melodies and rhythms became more prominent than the tone of the guitar. New names, somewhat new impression. My view now is to leave it alone. One thing that is a constant with Miledge Muzic is its honesty, and its freedom. I drop sticks, I go on. Tom has a moment of thought where to go next and seems to reach a musical void, the drums continue to push and drive until he finds a path to travel, and vice-versa. We feel no needs for perfection. Tom has the much more difficult task between the two of us to be sure. It's really apples and oranges. But in the duo format I believe we make it work and put out enough sound and energy to create an aural stamp of more than two people at times. Tom's guitar rig certainly makes that possible, technically, and then marries that to his moment by moment thinking and technique, as all improvisational musicians do. I often play like I'm attempting to play bass parts together with drum parts I hear in my head. Some would call that 'busy' as far as drum set playing, but in this music I believe it works. There is no bassist, and the spaces can be occupied to full strength if chosen to go that way. Soon comes the 'commercial' part - CD duplication and packaging and getting it "out there." This will be interesting. Snags and more snags. I designed the CD insert. I've been doing dtp (desk top publishing) for years using MS Publisher for my software. Come to find CD duplicating companies don't use Publisher. They like other dtps. The files can't be sent to them. So ... that means either upgrading my software (man, MS charges a lot for their stuff), or get new dtp software and start from scratch (the free software I have tried I do not like at all), use the templates provided by the duplicating company (not user friendly), or some software to transfer the files to PDF (which my version of Pub. doesn't do). I tried a couple free, online PDF converters. They worked fine, very easy to use, but there are resolution problems with the fonts and things. We know someone who has Publisher at work, and PDF converters, so hopefully we can send this off to a duplicating company soon. I suppose a lot of people just have the CD companies do it for them in their design departments. Costs more, obviously, and being a diehard DIYer, and enjoying that aspect of design, I do it myself. After two years of "Murphy's Law" why did I expect this part of the process to go smoothly? At this point it looks like CopyCats Media will get the job. They have the best price for what we want, I've read some good reviews, and I've had some good communication with one of their reps. There are a lot of companies out there. Not all have reduced lot rates. Given the music and it's probable "success" with the numbers of people into this kind of instrumental work we see no need to press a ton of these things. Especially seeing CD Baby and other such outlets will be the source of procurement for people. Not many duplication companies bother with small runs less than 300-500. Copycats has smaller run packages. Works for us to start with. Then comes the whole gig with distribution and sales and all. Just some thoughts. I'm closing in on 59. I've been away from recording music for 35 years. I was in my early 20's when Legend made 'From the Fjords.' Three decades later, as I've mentioned elsewhere on this site, to have that album attain the status it has is mind blowing. I was young, filled with entrepreneurial ideas, figuring we'd "make it." We would have, then, I was sure, and still am. I left the band to follow my new found Christian faith and all, so I never experienced what trying to sell that album was like. Fred Melillo, the bassist in Legend, remembers we pressed 500 disks, and a young artist named Ioannis did the artwork for the jacket. He went on to big things, himself. The album was black and white, figuring to save money. We'd do full color later. A cousin of Kevin Nugent the guitarist, mentioned to me thirty years later that he had boxes of the albums in the basement. Boxes of albums, which today can sell for upwards of $800 on ebay, or more in the marketplace for such things. I was told a guy in Europe paid $1300 for an original copy of the album. I paid a lot for mine, off ebay. But as Fred recently emailed me - the times are far different than the days we'd go into Cutler's Music (a record store in New Haven, CT) and buy an album just because the jacket looked cool. The industry for "Indie" artists, which Fred is part of, himself, is a madhouse of entries every year. Estimates range to over 100,000 new CDs hitting the market every year in the U.S. Digital downloads are outpacing physical CD sales, which are declining. Music videos have become an entire industry in itself, many believing they are essential to sales. Selling merchandise at venues of performance is big. Starting and maintaining fan bases via social networking is huge. I am reading stuff on the web that is both instructive, frightening, discouraging, and mind boggling. So, here's Tom and I. Both 58. His life basically settled with work and family. Mine totally opposite. We meet on Bandmix, get together, record things for two years now; recording music we think is pretty cool, has its own 'voice,' it's own nature and stature, musically. It will not be easy, or fun, or even interesting to try and get this music out to an audience, especially when we have no plans to play out in public. Just not going to happen, all things considered. It's it going to be extremely difficult, if not well near impossible, to find an audience for Miledge Muzic. The audience for such music as this, free-form, mixed genres, instrumental, is going to be small, as it is. At this point we hardly know what to call it. We call it free-form, but it isn't free of form, as some jazz is. It's jamming, but it's more than that. It's like a soundtrack with no film connected to it. It's multiple genres. It isn't songs, though the sessions are given names, based on what enters our minds for a picture as we listen back to them. If this was a listed genre, with 'songs,' this might be easier. We can call it 'other,' that's for sure, at the various web sites we can place it on. I'd love to have a career in music. I'm not going to. That is the reality. But, I'd love to make a living making music I love to play. The economy is bad, getting worse, which effects both musicians and audience. Such a small percentage of the population gets to do what they enjoy doing, and make a living at it. It is unreasonable to think just because you can play an instrument well you can make a living doing that. The population increases, the pool of musicians and talent increases, exponentially, and that thins out opportunities for musicians to be heard. Especially is that the case for music that is not "popular' music. The list of venues to be heard grows ever smaller. The music industry is, by the experience and opinion of the majority of musicians willing to share their stories, an evil empire that will eat you for a snack and in many cases, destroy you. The Independent music industry has arisen, based on need and advances in electronics equipment becoming more and more user friendly. But then, when you have your music, and record it, and package it, getting it heard is another matter altogether. However this works out, I can see, more and more, we did this for ourselves, at a time in our lives when we needed to: to express our lives through our instruments. If it sells, if any interest is given it, by anyone, that's just an icing on the cake. Inside, we know what we have produced. We hear what we have done. We like it. It has impacted our lives - the music, our friendship. That's really all that matters. Okay, so, I'm 59. Bad number. 9's are bad. They stare at you with the next decade in their fist. Well, the snags have been dealt with (we hope). More tweaking on the final mixes were needed. Got everything ready with a montage for various web sites, discussion boards, etc. Stuff is ready to go off to the duplicator. A CD is coming! Have mercy. I began to wonder if I would live to see it. Hey. It isn't here, yet. But we hope things finally go okay in this last stretch. I have to say, this first session, after we first recorded it, was monstrous to me, and I mean that in a seriously negative way. But, the more I listened, and the more I still listen, the more I see the potential and raw credibility for this project, and what lied ahead. So, I'm already thinking about mixing down the session for CD #2 - No Cruise Control. But, I get way ahead of myself. Anyway, that's where it stands today. Hopefully we'll hold that first disk out of the box very soon. Tom is the consummate tinkerer, the look under every rock kind of guy. He hears things, and pursues in earnest. What did he hear in the final mix? Well, more like what he did not hear - life. He wanted more life. So ... he tinkered, and fussed, and turned his knobs and flipped his switches, worked his 'thing' and out came huge sound. Gargantuan, Jupiterian aural power. Quite impressive, I have to say. For just two musicians this sounds like a conversation between armies. How did he do it? I'll never tell. Of course, I have no idea, so I couldn't tell you anyway. Track 2, named Dances with Dinosaurs, launches itself from a guitar 'overture,' and bringing up the guitar even more in the mix (I just felt the drums were too dominant) made the track just burst with flavor I had not tasted, and I have listened to it dozens and dozens of times. It's amazing what a notch or two can accomplish. More than that, Tom just brought out a sense of explosiveness so that 'Titanosaur Tango' truly sounds like a Titanosaur dancing away in earth crushing glory. But then the track enters 'Pterodactyl Two-Step,' and all the power glides effortlessly into some real fusion comfort food to the finish. So ... once again, I believe the files are going off to the duplicator now. We are puttin' the casserole in the oven and expect to chow down on a great meal very soon. So, B, your Dad ain't done yet. There's still some energy in these tired ol' bones. Ha! You're gonna love it. Well, we made it. Actually, that is a literal statement, isn't it? The era of self-produced recordings. The CD is back from the duplicators. It's been a long haul. They did a nice job. New Life, in Nashville, TN. The only blip was the bar code. It got placed in a weird spot and changed some graphics, but something to remember for next the release. Now it's CD Baby, and wherever else we choose to market it. 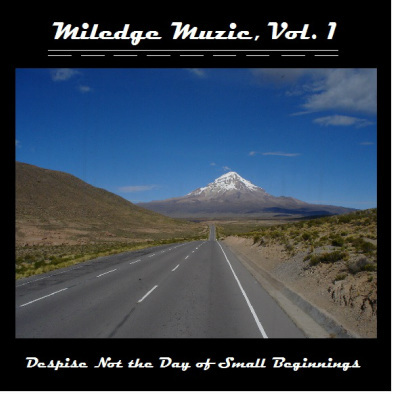 So, here it is - Miledge Muzic, Vol. 1, Despise not the Day of Small Beginnings. Well ... not yet. Glitch. Interesting, too. First, while driving around and listening to the CD I felt the gap between the two tracks was a little too long. Tom agreed. Second, and this is hilarious. I named the tracks. Track 1 is called 'Lunch in the Oort Cloud. I designed the Cd inserts, and also what to print on the disk. Then I placed it all on a flash drive and sent it to Tom. I had to go on the road for awhile. For some reason the artwork for the disk was not on the flash drive. So, Tom put something on there for the Duplicator. So, I'm driving along and my player is showing the name of the track, Huh? 'Launch' in the Oort Cloud? Tom thought that's what it was. Agh! So, now, a choice. I wanted to do Lunch in the Oort Cloud, an obvious hyperbolic thought if ever there was one. Tom felt Launch made more sense, for the obvious reasons. If you may not know, the Oort cloud is a suspected sphere of icy objects, asteroids, etc, about a light year out from our sun in all directions. There is no actual proof of its existence that astronomers agree on. So, doing lunch at some bubble bistro in the Oort cloud is about as futuristic a thought as you can imagine. The track just brought that thought to my mind. So, I email Tom and confusion ensues. He thought I meant to state Launch and changed all the places the term is used, applied for ISRC codes with that title, and sent me the new artwork. ??? So, back and forth we went. For expedience' sake I figured go with Launch and make it easy for Tom at this point. So, back to the Duplicator goes the new master with shortened gap and new wording, while CD Baby is awaiting the final front photo and file download. Stuff like this happens. Back in the 70s Return to Forever had a glitch like this. Lenny White wrote the track Shadow of ... well, he wanted 'io,' one of the moons of Jupiter. Atlantic records produced 'Lo,' and Shadow of Lo it remained. Now to figure out what to do with this batch of first runs. You get older and time is a real enemy, most of the time. In this case two years has gone by since I began this blog and finally the disks are off to CD Baby. After all this time the music retains its power and intrigue for me, no matter how many times I listen to it. Now it remains to be seem what listeners think. Of course, this also brings in an element of time - the time necessary to develop ways to get people to hear it. When even the big names in music see sales falling, and no one has a real solid handle on where things are going, other than the lean towards buying downloads rather than hard disks, getting people to your disk to listen to your music is a real challenge, far more daunting than back in the day when things were so much smaller in ability to produce music for retail sales. Now ... almost anyone can produce their own CD right at home. Anyway, that's where it stands. Cd Baby. We'll see how that goes, first.